Have you thought about what makes a child do homework well, and how to get your child to achieve his or her full potential at school? There are many factors, but surely having the right tools to do the job is an important one. And having the right study desk should definitely be near the top of the list of priorities. A desktop with a large surface area lets children organize their space when they are working. This is particularly important when using large textbooks or A3 paper for art. A bright and colourful environment helps motivate a child. When a child is happy and motivated he will concentrate more. Having good posture, achieved by correct reading distances and angles of vision, helps skeletal growth and eyesight. 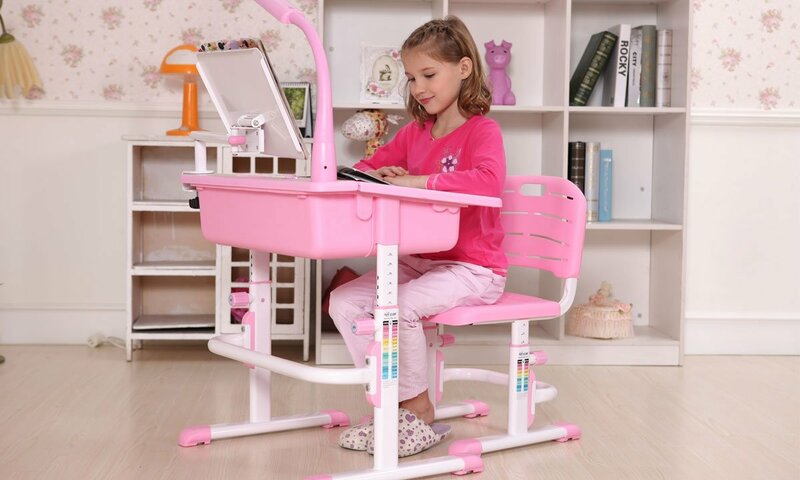 A desktop with different angles of pitch allowing for a variety of activities, such as reading, writing and painting. Children shouldn’t spend too long on a particular task and variation helps to keep the mind keen. Having a height adjustable desk, so it can be raised to accommodate a growing child. This coupled with a height adjustable chair will mean no banging of the knees under the desk and good support for the legs and the lower back. A solid, sturdy construction can last a school career. A good quality desk should last many years. Having compartments to put all their pencils and crayons in, and room for books and writing paper keeps the work surface clear. Too much clutter can cause errors and be distracting whilst working. At Best Desk we believe in a child’s ability to achieve his or her fullest potential. By providing the correct equipment, designed to fit this specific purpose, we reckon your child will be on the right track to doing homework well.